In a series of journal posts, The Hive collaborator Laurie Crombie, documents the process of building The Hive, from its first showing for AND Festival 2017, to its most recent stage, developed for The Other Festival in Indonesia. The project began with the idea of ‘listening to the dark’ which was a strand of the 2017 AND Festival and was about reacting to Peak Cavern in Castleton. The response by Ikbal Lubys and Tony Maryana, two Indonesian artists commissioned by AND was to go to there nearest cave in Jogykarta and listen to the dark… They discovered a beehive that was producing some interesting sounds as lot of bees were making similar pitched humming noises creating oscillating wave forms. 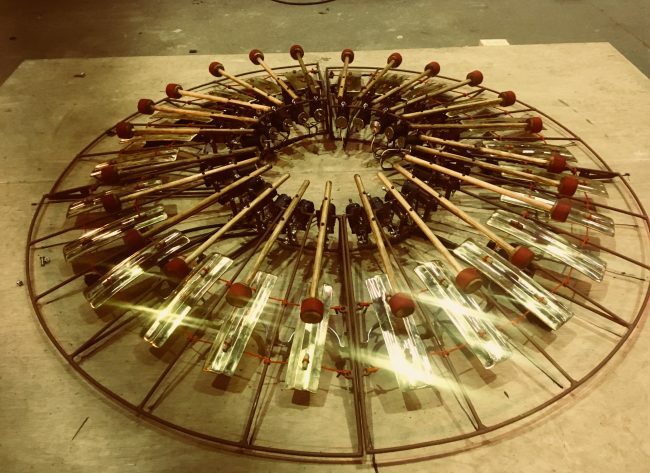 A plan was formed to create a mechanical version of this beehive that could autonomously create the same sonic effect using the sounds of a Gender, a traditional metallophone type instrument central to the Gamelan. We changed the shape of the instrument from a linear set up like a xylophone into a circular pattern that was closer to the shape of the beehive. We had a tight time line to build the first Hive. Tony and Ikbal were bringing half the instrument and the control system from Indonesia but the bag containing it was lost on route by the airport in Amsterdam! With this news at the 11th hour we were forced to make a control system out of parts we had to hand in the workshop and we were also missing half the notes so creating oscillating wave forms like the bees was not fully possible… Although the sound it made was not quite as intended the installation worked well in other ways and the cave created some interesting harmonics. The Hive was going to bluedot festival and full of noises festival in summer 2018 so needed reworking! In the kazimier workshops I set about designing and making a new design for the beaters based on a solenoid actuator and powerful enough to create a strong tone. The new Hive also needed a new control system so Charles Pethica designed a system allowing the instrument to be triggered using midi, allowing it to be controlled in any way we wanted (See here for more info on the electronics). The musical compositions for the new Hive where made by Tony and Ikbal from Indonesia then uploaded onto the Hive. Viewers of the installation pulled leavers triggering different compositions of increasing complexity. By the end of the summer the Hive was quite developed technically and as a musical instrument. It was time to pack up the most essential parts that could fit on a plane and head to Indonesia to re-join Tony and Ikbal to work on the next version. We decided to commission a new set of sounding-bars that were more similar in pitch therefore better at creating the waveform of the bees. Exciting for the Hive to be in Indonesia where it was conceived and over the next few weeks I’ll be working on it at Ikbal’s studio in Jogykarta, ready for its Indonesian debut at the UKID festival in Jakarta. Lead Image: The Hive at Full of Noises Festival, Barrow in Furness. The Other Festival is a brand new festival of creative technology, music and art. Featuring music performances inside art installations, talk shows formatted as bar conversations, film screenings inside hotel rooms, and digital installations by UK and Indonesian artists. The Other Festival is in partnership with Double Deer (ID), Hotel Monopoli and Tokopedia.